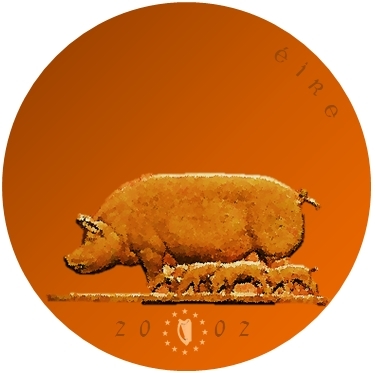 Revive Metcalfe's animal designs in Irish Euro Set! 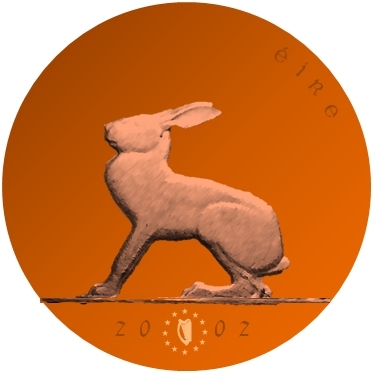 Since I saw Figleaf's great post about the old Irish coins, I decided to revive Metacafe's old design in Ireland's Euro set. I'm not an artist and cannot imitate the simple beauty of original design, so sadly I'm not able to add any new animal to the set. It turned out, only the 2 Euro coin is completely satisfactory. 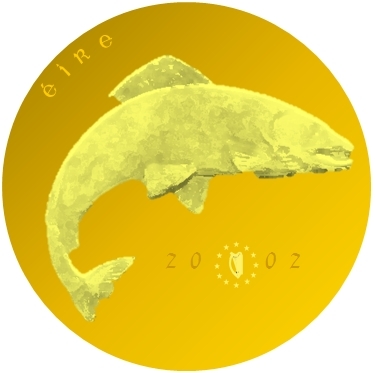 For me, though, 2002 marks the second great tragedy of modern Irish numismatics ... the complete loss of the Metcalfe designs, coupled with the fact that the Irish chose only a single design for their national side of their new euro coinage: the harp. The beauty and variety of the old designs were now lost. 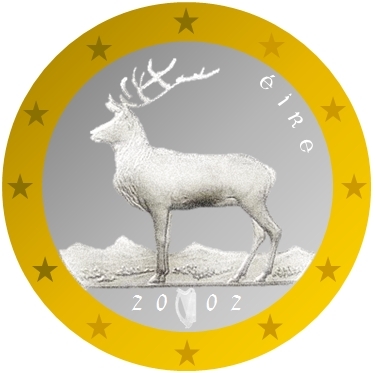 Even fans of the euro have often bemoaned the fact that the Irish chose a single boring design. The Irish themselves still seem be in love with the old Metcalfe designs, judging by their recent collector issues. Whether they were well advised to attempt to update Metcalfe's designs in such a way is a moot question. 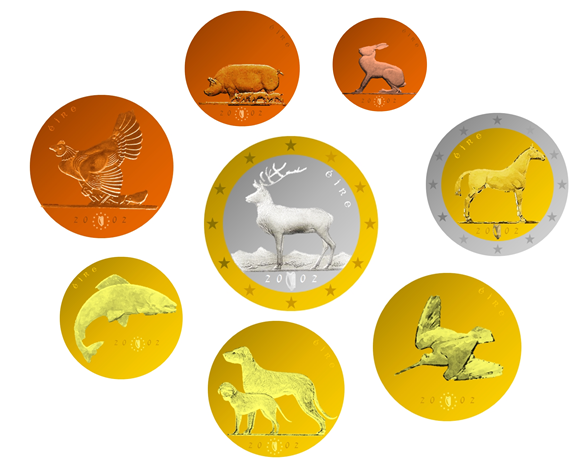 Re: Revive Metcalfe's animal designs in Irish Euro Set! The whole set look like this. Great idea. While I am not so fond of merely repeating old designs, these examples show very nicely that it would be (or have been) possible, to combine some "main theme" and the harp. If the government insists on using the harp on all coins, then this size - a little bigger would be fine too - should do in my opinion. I am not so fond of merely repeating old designs, I would have preferred different "subjects", important buildings or people maybe. While there are many great buildings and great people in Ireland, it's hard to think of a design nicer and more identifiably Irish than the Metacafe designs. I would have gone for a new set of animals if I seriously want to have a new design, but still in the stile of Metacafe's. A portrait set or a building set would not stand out, since many other EU countries also have them. A set featuring different kinds of national symbols (shamrock, Irish cross, Irish compass rose, Claddagh ring, and the harp) would also be interesting, like the first UK decimal set. I would prefer personalized Hibernia. 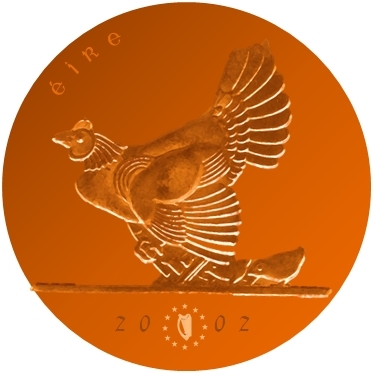 Before they come out with the harp design, they should have reminded themselves that people have to look at these coins for the next thirty years. Yes, the harp would indeed be " a little bigger". 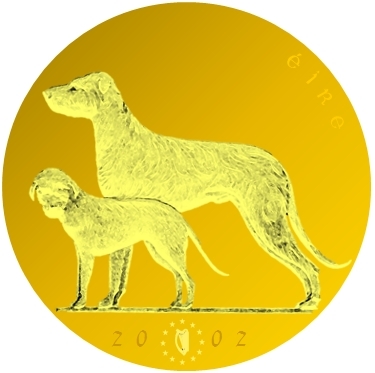 I was thinking of this coin when I decided to downsize the harp and the stars.